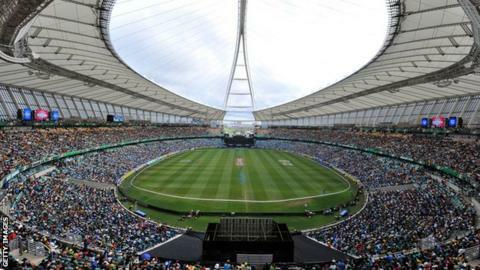 South Africa's new domestic Twenty20 competition has been postponed by 12 months until November 2018. The inaugural T20 Global League was set to begin next month with England's Eoin Morgan, Jason Roy and Kevin Pietersen among the 'marquee' internationals. The decision was taken at a joint Cricket South Africa and T20 Global League board meeting. The South African Cricketers' Association expressed "concern and disappointment" at the decision. It also called for an independent review into the reasons for the postponement, as well as calling for recompense for affected players. The league, planned as South Africa's answer to the Indian Premier League and Australia's Big Bash League, was due to start on 3 November. "I feel so sorry for all the youngsters who were going to learn and earn out of this comp! Disaster for SA sport!" said Pietersen on social media. "To think of the number of SA youngsters, players about to retire and coaches missing out this season is simply not good enough!" Haroon Lorgat, the chief negotiator of the league, resigned as Cricket South Africa's chief executive last month and was replaced by Thabang Moroe as acting chief executive. Moroe said: "We have not come to this decision lightly. "Having discussed it with all our stakeholders including the franchise owners, we believe that the interest of the league should be our first priority. "We have re-assessed our strategy and believe that postponing the first edition of the T20 Global League to next year will serve us well. "We will regroup and come back stronger and better." Tony Irish, chief executive of the South African Cricketers' Association, said the postponement would have "a very significant impact" on 144 local and overseas players who had signed contracts or been drafted to play in the eight-team league. Irish said his organisation would be looking at all implications of the postponement for players, "including what compensation should be paid to them".